Is this a post-Halloween joke or April Fool’s Day come early? 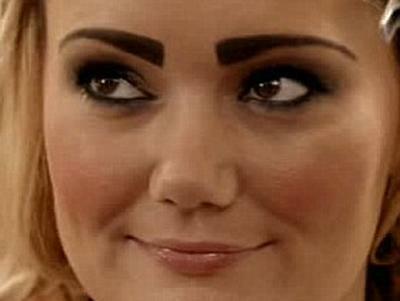 MSN.com is reporting that the latest trend in brows in Britain is the “Scouse brow,” as seen on “Desperate Scousewives,” a new reality TV show that follows the lives and loves of eight blokes and birds in Liverpool. But is this really a look that Brits are going to recreate? Only time will tell. I will say that I doubted that the mullet would ever become a fad and then visited the UK a few years back, only to find mullets on the Tube, on the high street, on the bus. Posted on 1, December 2011, in Fashion, TV and tagged brow, Desperate Scousewives, Scouse. Bookmark the permalink. Leave a comment.